Have you checked Maria Sharapova’s Fan page on Facebook? If the answer is no, then you are missing out on a juicy piece of patriotism! 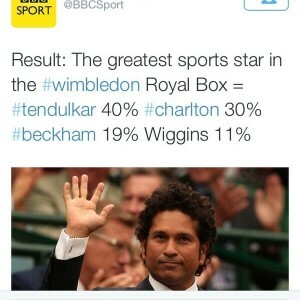 Apparently Maria Sharapova had revealed that she doesn’t know who Sachin Tendulkar is. But she doesn’t need to worry, we all have decided to enlighten her. So her Facebook wall has been flooded with a lot of criticism for the arrogance she has displayed by the fans of Sachin, and many a people have went as far as using derogatory remarks and abusing her. It came as a shock to the readers when Maria Sharapova replied to a question “Do you know who is Sachin?” by saying “I don’t know”. She has not just aroused fury amongst the Sachin Fans, but across the sports’ fan in the world because such a statement from a sportsperson for another legendary sportsperson is downright rude and intolerable. Maria Sharapova who is 5-times Grandslam Tennis Championship winner is hugely popular in the world but the love fans have for Sachin outweighs her international fame. If you go and check the fan base both the sport stars have on their respective Facebook pages, then Sharapova’s page has 13.6 Million likes, whereas for Sachin it is 20.1 Million likes! Despite all the fury shown by Sachin supporters, Sachin himself was at his formal best while sitting in the Royal Box with other sporting legends including David Beckham, Sir Bobby Charlton, Bradley Wiggins and Chris Robshaw. Well, speaking of greatness, it was what Sachin had displayed and not Sharapova who would be paying the price of her arrogance for a long time to come. Especially so for her Indian fans, because in India the likes and support for a celebrity is not merely driven by the showcased talent, but also by the emotions that they arouse in the fans. If you have also come across anything worth sharing related to this issue, any fact or funny comment, the feel free to share with us below! 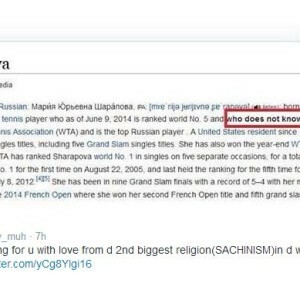 Also, following are some screen shots of Sharapova’s Fan page for all those you are just too furious to go over and land at her page! « NIT Warangal: Why to Join It and Why to Avoid It?